At the moment, the region’s lollipop men and women will be hanging up their sticks at the end of June when their contracts come to an end. That is due to the cash-strapped local authority’s cost-cutting plans, with the crossing patrollers preparing to be axed for the second time in two years. Community councils from all over Moray are, however, now working together in a bid to save them and offer a safety net to local children. Carolle Ralph, vice-chairwoman of Lossiemouth Community Council, insisted that they were working as quickly as possible to find a solution that suits everyone. She said: “It is fair to say that we are very concerned about what is going to happen in the future, especially in busy places like Elgin and Lossiemouth. “We are talking to parent councils throughout the region to come up with a solution that suits everyone. 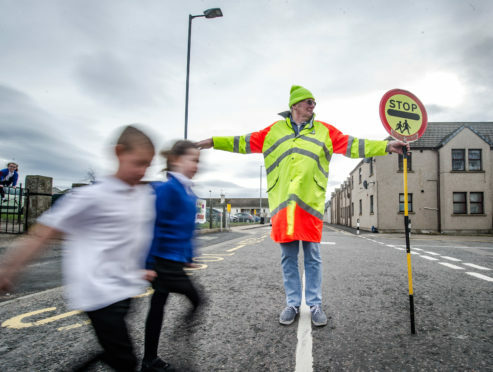 A survey spearheaded by Lossiemouth Community Council is being run across Moray to gather views from families about whether they would be willing to pay to retain school crossing patrollers, with an annual charge of less than £10 needed to cover the cost of the service. Safety concerns were raised in Elgin after police operations outside schools earlier this month revealed that some motorists were ignoring road rules. Eight motorists were caught failing to stop for school crossing patrollers. Elgin Community Council chairman Alastair Kennedy is keen for something to be done about the patrollers but has warned about the possible costs involved. He said: “The Joint Community Council have a sub-committee looking at ways of creating an entity that would employ school crossing patrollers. “This may prove to be very difficult, however, and is just one of the things they are looking at. “Obviously for safety reasons, we want them to be kept on, but we understand why they have been cut as the council have no legislation that requires them to keep them.